AlibabaPost-founding meeting in Jack Ma’s Lakeside Gardens apartment in Hangzhou, 2000. Alibaba founder and CEO Jack Ma may now be worth about $US23.8 billion, but he comes from incredibly humble beginnings. Ma grew up poor in communist China, and it took him some time to find his way. He failed his college entrance exam twice and was rejected from dozens of jobs, including one at KFC. 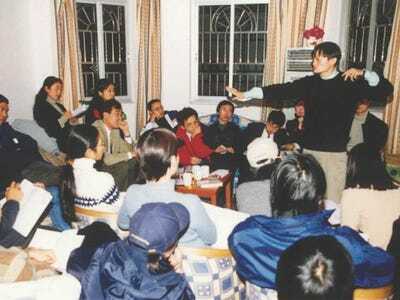 Ma was living in a small, six-room apartment in Hangzhou, China when he came up with the idea for Alibaba in 1999. Though the billionaire no longer lives there, that apartment is still a major part of Alibaba work culture today. According to CNBC, Ma has been sending his most talented programmers and product managers to do their work in the apartment. The apartment isn’t far from Alibaba’s new headquarters, where employees can make use of exercise facilities, basketball courts, foosball, pool tables, and gourmet cafeterias. Still, the 30 employees chosen to work at the small apartment feel lucky to be there. “It’s an honour for all people to work here,” Alibaba product manager Chen Hang told CNBC’s David Faber. Watch the video below to see CNBC’s full tour of the apartment.